MIDSOLE Flytefoam utilizes organic fibers that are embedded into the foam to offer lightweight resiliency. Rearfoot Gel cushioning system uses a silicone-based gel for responsive shock absorption on impact. Dynamic DuoMax Support System uses a dual-density material in the midfoot to reduce over pronation. Propulsion Trusstic System utilizes a thermal plastic unit that connects the lateral heel to the medial forefoot. This unit works to release stored energy and propel you forward during toe-off. Impact Guidance System (IGS) design creates a smooth and balanced heel-to-toe transition. Guidance Line is a vertical flex groove in the forefoot for improved gait efficiency. OUTSOLE DuoSole Outsole provides lightweight, flexible, and durable traction. ASICS High Abrasion Rubber (AHAR) in the heel is made of carbon rubber for exceptional durability. DuraSponge in the forefoot is made from a blown AHAR compound, for responsive cushioning and flexibility. 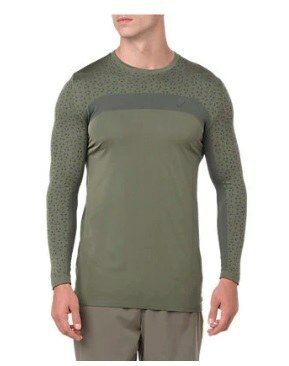 UPPER Adapt mesh on the upper provides highly breathable and flexible coverage. Seamless Upper Construction allows for irritation-free sockless wear. Heel Clutching System uses an exoskeletal structure that wraps the heel for a secure fit. With a fast feel and added stability for overpronation, the ASICS Gel DS Trainer 23 delivers a light and responsive ride on the roads. A lightweight and resilient Flytefoam midsole provides high energy return with each stride while the Dynamic DuoMax support system creates additional stability. Sticky traction from the outsole helps grip the roads, and an updated Adapt mesh upper improves the breathability and the flexibility of the hold.